Never again! Never lose an elk again due to poor penetration or a shoulder hit. Learn what works when bowhunting elk and see what bowhunters have to say about their success using heavier tapered carbon arrows and tough, razor sharp, single bevel and double bevel cut on contact broadheads. This page has a lot of hard to find information on what really works for successfully bowhunting elk. Many bowhunters who find us are searching for something that will end the cycle of light fast arrows and mechanical broadheads that fly well but can't get the job done when they get to the elk. These guys are fed up - they've have too much of what doesn't work - They're ready for what does work. 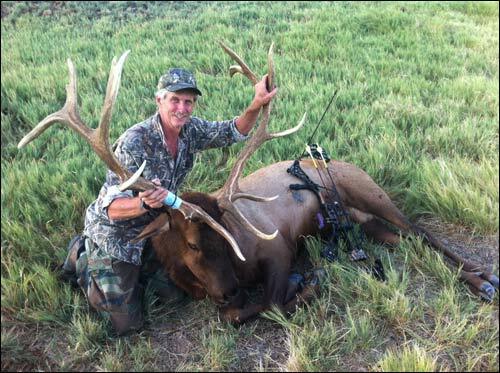 "I finally got a chance to shoot a big bull elk with your Samurai Broadheads. What an amazing Broadhead! Thank god I had one because my arrow punched through the front leg bone and stuck in the opposite side shoulder bone at 65 yards! This awesome New Mexico bull was taken with our 650 grain (all in) GrizzlyStik Momentum arrow tipped with a 200 grain GrizzlyStik Samurai broadhead. The shot was taken at 31 yards from a 70# bow. The GrizzlyStik system made a complete double lung pass trough while striking and breaking - both - of this monsters scapula's. The bull was down in sight within 20 seconds and arrow was recovered intact 30 yards past the bull. This New Mexico Monarch had a green score of over 410" and an estimated weight of over 1,100 lbs. It's not easy getting a shot opportunity on a trophy elk. To even get there you're already invested on many levels. Forget the plane tickets, guide services, and licenses - elk hunters have worked hard getting in shape for the hunt, they've poured over maps, put in for tags and permits, invested in the best clothing, boots, backpacks, knives, and all the other gear. 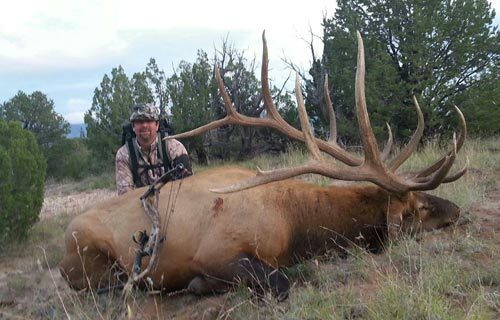 They work hard to get even a single shot opportunity on a nice bull. Watching a hard earned trophy run off with an arrow that didn't perform is demoralizing. It's just not acceptable! And it doesn't have to happen. For anyone who has experienced this, they understand... "Never Again"! Most of these guys turn to the Internet. They search; broadhead penetration, arrows for elk, broadheads for elk, better penetration, etc. Sooner or later they find our website and spend hours digesting the information. 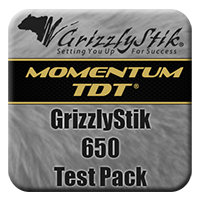 We highly recommend that you start with a GrizzlyStik 650 Test Pack. It comes with two GrizzlyStik arrows, matched to your bow, with a total weight of 650 grains. By testing this set up in advance - you will know how well these arrows fly for you before investing you the dozen or so arrows you'll want for your season. We often get asked if heavy, high FOC arrows are a fit for bowhunters with short draws and/or shooting lighter poundage bows. As seen in the video, we have found it’s even more important for these bowhunters to maximize arrow weight and FOC to gain lethal penetration. Kristin Holt used a Mathews Jewel set to 50# at a 22.5” draw for her first archery elk hunt. We set her up with 650 grain (all in) GrizzlyStik Momentum tapered arrows tipped with 200 grain Maasai broadheads. Her arrow system had a 26% FOC and it puts this New Mexico bull down in under 30 seconds. Enjoy more bowhunting success. Learn about taking the GrizzlyStik 650 Challenge and testing our system for yourself. Are you looking for arrows and broadheads that work even when things go wrong? In the real world of bowhunting, things go wrong more often than we'd like to admit. If you've reached a point where you're willing to step outside of outdated 'conventional wisdom' and listen to the logic of a system that has proven itself deadly on elk since its inception - read on. 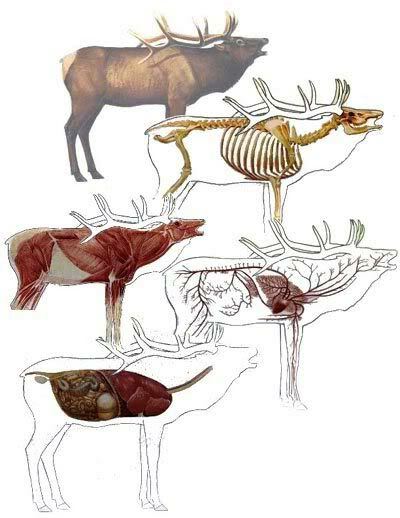 This testing was done on animals much larger than the elk we're discussing here as well. In the words of Dr. Ashby, the man behind all that testing, "If it works on these brutes, a whitetail (or an elk) will be a piece of cake." The GrizzlyStik system had been developed to offer you elk bowhunting equipment that meets all of the crucial criteria covered in the report: "The Top 12 Penetration Enhancement Factors" that were identified by and ranked in order of importance by Dr. Ed Ashby. We also discovered and share with you here, another important reason behind "Why a somewhat slower but heavier arrow can out-penetrate faster lighter arrows while penetrating any medium, including hide, meat, and bone." The secret is found here in our report titled: "Tissue Resistance to Arrow Penetration". Because so many bowhunters have been told to look only at the kinetic energy their set up creates, we also have a report that shows why measuring the MOMENTUM your set up generates is a much more important and predictive measurement of your potential for bowhunting success. "The Power of Momentum"
Access to all the Dr. Ashby Reports. 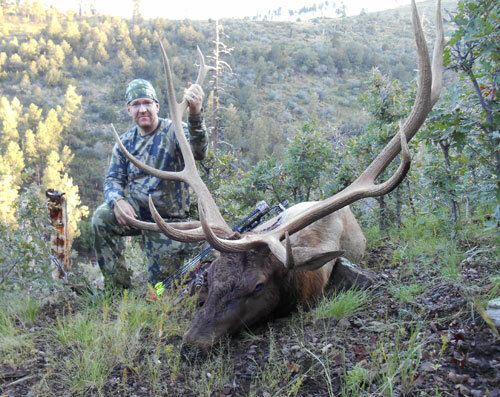 "Here is the result of my Tule Elk hunt. 50 yard shot, quartering towards me from the left. Arrow was a GrizzlyStik Momentum and a 200 grain Maasai single bevel broadhead. it entered the vitals on his right side and exited farther back on his body on his left. You can see the arrow in the photo. It passed completely through his body! He immediately dropped his head, slowly walked about 60 yards, stood for about 3 minutes and dropped. We talk to elk hunters just about every day who are looking for a broadhead and arrow set-up that will work well on elk because they've lost one (or more) due to poor penetration from their light fast set-ups and ineffective broadheads. *You don't HAVE to go that heavy to get better penetration, but if you want reassurance that you can make it through heavy bone, you need to be shooting a total arrow and broadhead weight of 650 grains or more. Step 1.) Select a GrizzlyStik arrow: You need an arrow that flies perfectly from your bow. For that reason we always recommend that you purchase one or two test arrows and a field point test pack. With these you can test the arrows, with various point weights, and perhaps even at different arrow lengths, to see which combination gets you closest to that 650 grains of total arrow weight, and flies perfectly from your bow. Think of this like building yourself super accurate hand loads for a hunting rifle. It's the best way to go. However - many bowhunters don't want to test. They just want us to tell them what they need. For anyone who does not want to do the testing themselves, we can talk to them on the phone and once we get all the information we need. Then we can give them our best guess of which combination should work well. We will give you a very educated guess and get you very close to your ideal setup. Think of this as shooting factory loads. It's a lot easier, and faster, and still gives you good hunting accuracy and because you're using GrizzlyStik arrows and broadheads, it'll give you incredible penetration potential and arrow lethality as well. To discuss your arrow selection with our technical support staff call: 888-697-9828. This step is more complicated, but only because you have so many great choices in broadheads and because you have three broadhead selection considerations. Consideration 1: Broadhead - Single Bevel or Double Bevel? Once you've read the Ashby reports though and watched our bone breaking videos where we show GrizzlyStik single bevel broadheads splitting a moose scapula and breaking huge cow leg bones - you'll want to know more about the way single bevel broadheads work. A good place to start is by reading Why Single Bevel Broadheads? - by Dr. Ed Ashby. GrizzlyStik Silver Flame broadheads, when pushed by enough arrow weight can PUNCH through bone. GrizzlyStik Single Bevel Broadheads, when pushed by enough arrow weight can SPLIT bone. Once bone is split the drag against the arrow shaft is all but eliminated which adds significantly to the penetration you will get after the bone is breached. As for most bowhunting, when hunting elk we recommend that you shoot the heaviest broadhead you can. Go with one that will get you to the 650 grain mark, and still fly perfectly. The reason for this is to get your FOC. (Forward of Center) as high as it can be. This is recommended because Dr. Ashby had tested and found that the higher your percentage of FOC (forward of center) the more your arrows will continue to penetrate once the heavy bone threshold has been breached. This is a crucial consideration when bowhunting for elk. If you have gone through the testing procedures mentioned above you will already know which point weight will work best for you. If you don't know and just want us to make the recommendation call the GrizzlyStik tech support department at: 888-697-9828. We will be able to help you out. Here is an example of expected frontal penetration with the 650 system. "Anything from the front" is one of the most ethical shots we can recommend - you simply can't shut animals down any faster.